An ex-New Yorker living in San Francisco – eating everything in sight. A food blog for local restaurant reviews. Drop everything, I’ve got a new favorite restaurant in NYC. On the day we visited, Amy and I were in a celebrating mood. She had just started a new job and I’ve was just about to begin a new job of my own. On this occasion we were looking to treat ourselves right, to splurge on something extra special. 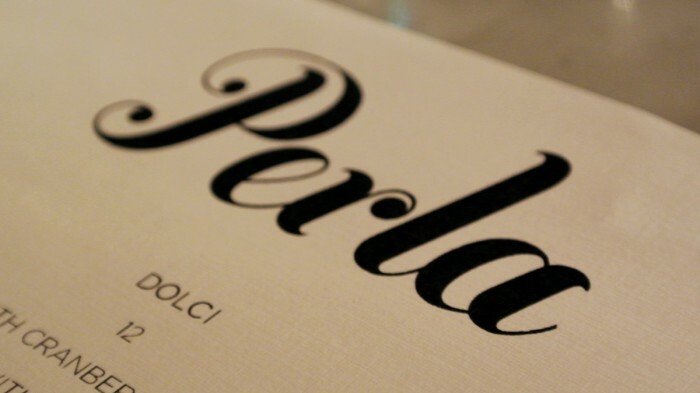 After seeing numerous end-of-2013 lists that included the nearby and recently opened Perla, I knew I wanted to try it out and figured this would be the perfect opportunity to do it. We made a reservation only a few days in advance and were able to snag seats at the chef’s counter for a Sunday evening at 6:30. It was a bit earlier than we usually dine, but what the hell, it was a Sunday night anyway. 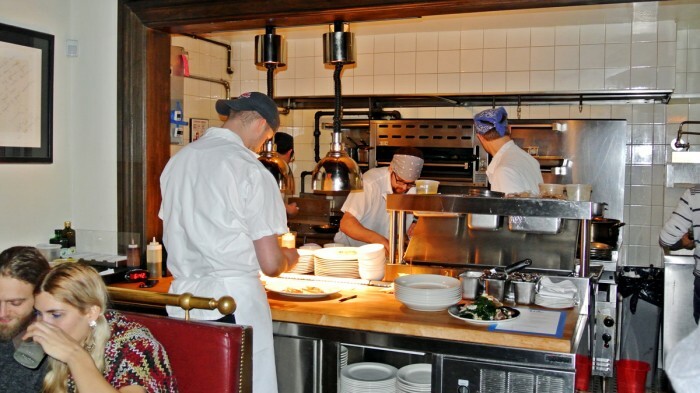 We arrived at 6:30 sharp and were immediately seated at the tall chef’s counter in the rear of the restaurant. After a quick look over the cocktail menu we each decided on a drink to begin with. For Amy, the Tigerjuice and a Tombstone Sunday Nights cocktail for myself. 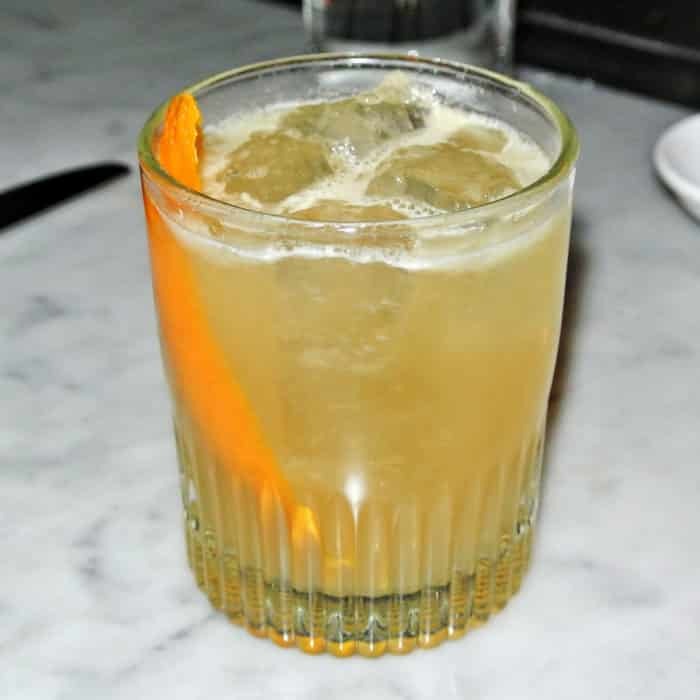 Amy’s drink, Tigerjuice, was made with Johnny Drum bourbon, Pierre Ferrand Dry Orange Curacao, and lime juice. This drink was quite good though a bit sweeter and more sour than either of us had anticipated. It had a bit of a lemonade vibe, though definitely more complex and boozy than my oversimplified description gives it credit for. My beverage, the Tombstone Sunday Nights, seemed awfully appropriate considering it was a Sunday night and we were celebrating the conclusion of my first job in NYC. RIP TBG. 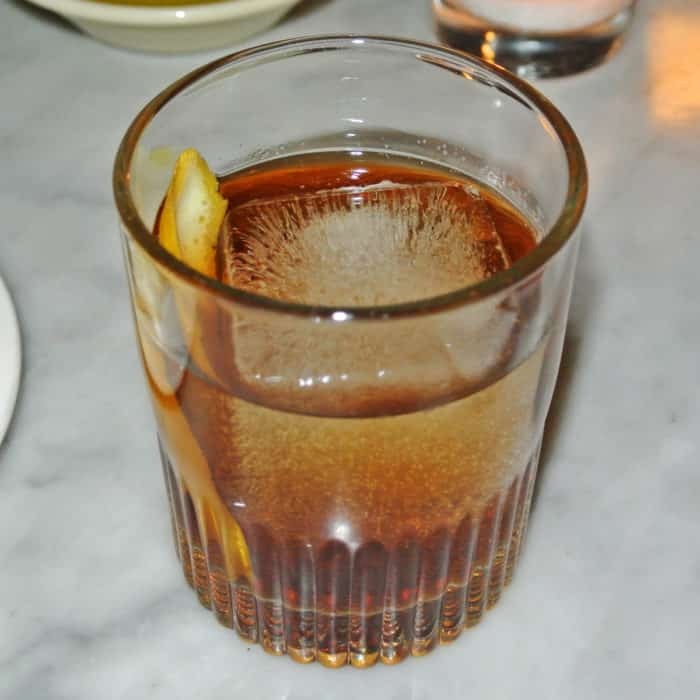 This drink was made with Cinnamon-Infused Bourbon, Amaro Montenegro, Bonal Gentiane, Chile Soy Maple Syrup, and House Pepperoni Bitters. This ingredient list sounds pretty wild, right? Well, it was actually quite a bit subtler and more restrained than I expected. This isn’t a bad thing, it just was quite a lot tamer than those ingredients made it sound. It tasted mostly of bourbon sweetness with a bit of wintery spice flavor from the cinnamon and a touch of the amaro’s root-flavor and maple syrupy sweetness coming through on the back end. Again, it was a nice drink, but tasted much simpler than I thought it would be. 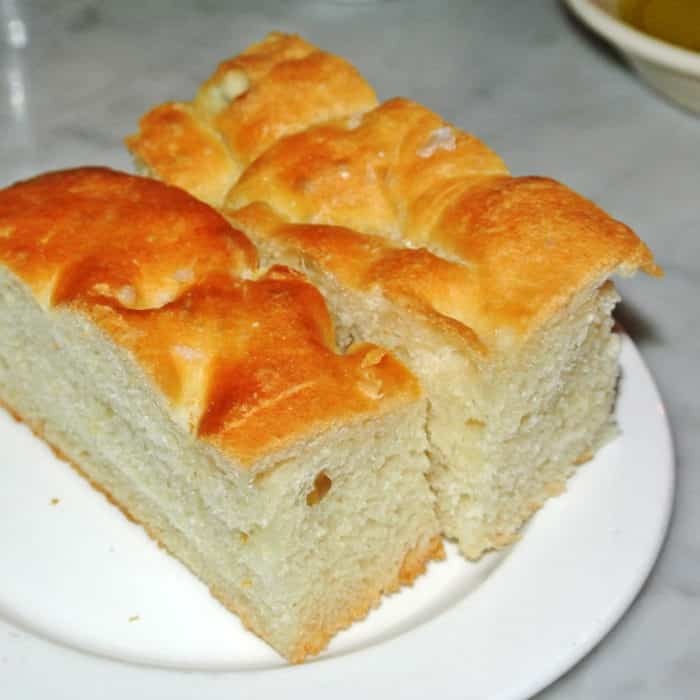 At this point, the house-baked focaccia bread arrived along with a shallow bowl of olive oil and flaky sea salt. We knew we had some amazing dishes on the way, but we couldn’t resist their incredible bread, olive oil, and salt because they were so delicious together. I am glad I saved a bit of it though on the foccaccia though. You’ll see why in a bit. While we waited for the meal to really begin, the kitchen brought out an amuse bouche for each of us to enjoy. 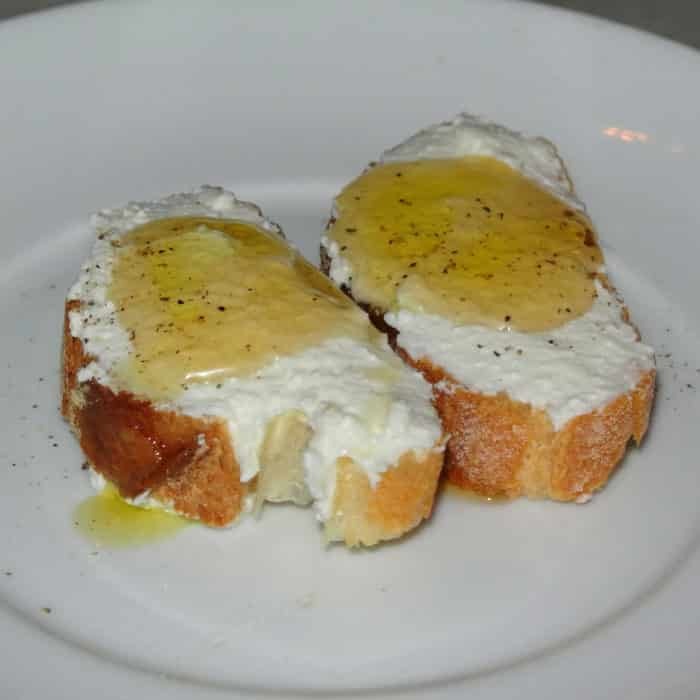 They served two crispy crostini breads smeared with a thick topping of creamy ricotta cheese, golden honey, and cracked black pepper. It’s amazing how something so simple can be so damn good. The ricotta’s mild creaminess paired so well with the sticky, sweet honey and spicy black pepper bits. This was definitely a good sign of things to come. Amy and I both decided to order meat-centric main courses, but I knew we would regret it if we didn’t try one of their much talked about, highly regarded pastas. 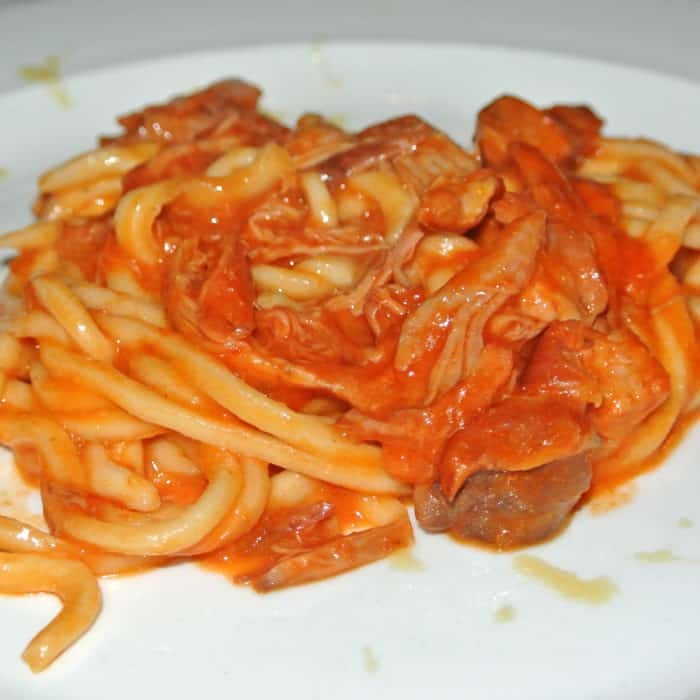 We decided to split a pasta dish called Pici with Duck Ragu & Foie Gras as an appetizer between us as an easy compromise. Before dining here I had never heard of pici (pronounced “peachy”), but now I’ve learned that it’s a hand-rolled pasta that is essentially fat, slightly irregular spaghetti. 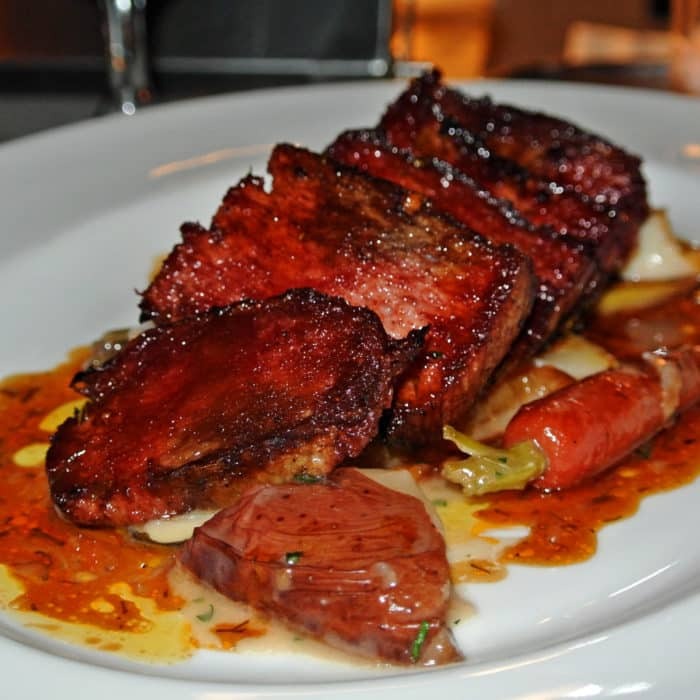 This version came with a creamy, rich blush ragu loaded with large hunks of tender duck meat and was topped tableside with shaved frozen foie gras for extra richness. Let me say that again, they had a hunk of frozen foie gras that they shaved over top the pasta like grated parmesan. Ridiculous. The pasta was cooked perfectly with a nice chewy bite that paired well with the seriously bold, rich, meaty ragu. This was such an incredible dish to start the meal and you better believe I soaked up every last bit of that sauce with the remaining focaccia that I had saved. I should mention that my photo is of a half-portion of the pasta dish because they were kind enough to split the dish for us before serving. Seriously decadent and seriously awesome. At this point, Amy and I were finishing up our first round of cocktails and were asked if we’d like another. We were celebrating… so yes, yes we would! We looked over the cocktail menu once again before Amy selected the Stop, Collaborate and Listen and I chose the Buddy Bye #2. I think we were both in agreement that our second round cocktails were even better than our first round choices. 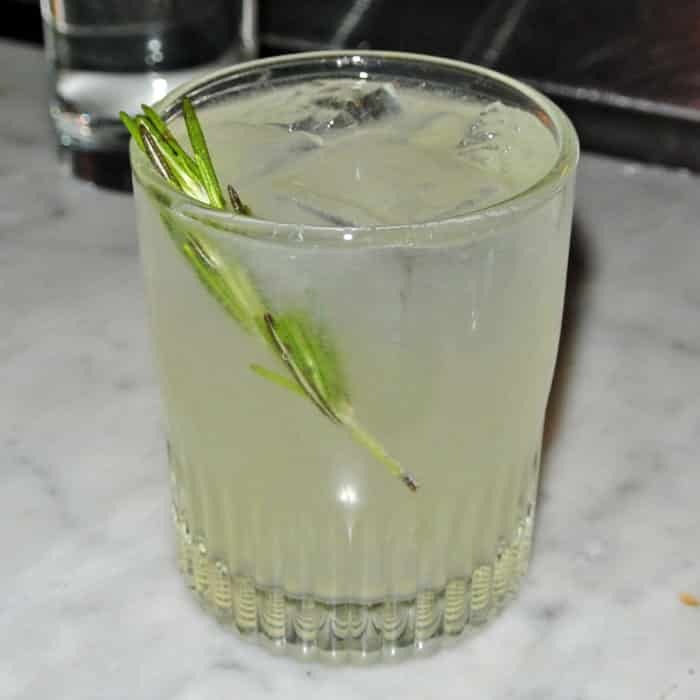 The Stop, Collaborate and Listen was made with Blanco Tequila, Rosemary-Vanilla Syrup, Ginger Beer, and had a rosemary garnish. It was a really nicely balanced drink with a few really interesting flavor twists including an herbal rosemary nose, a sweet and almost creamy vanilla flavor, and gingery backbite. This was another really excellent cocktail, but this drink was actually quite tame when compared to the drink I selected. 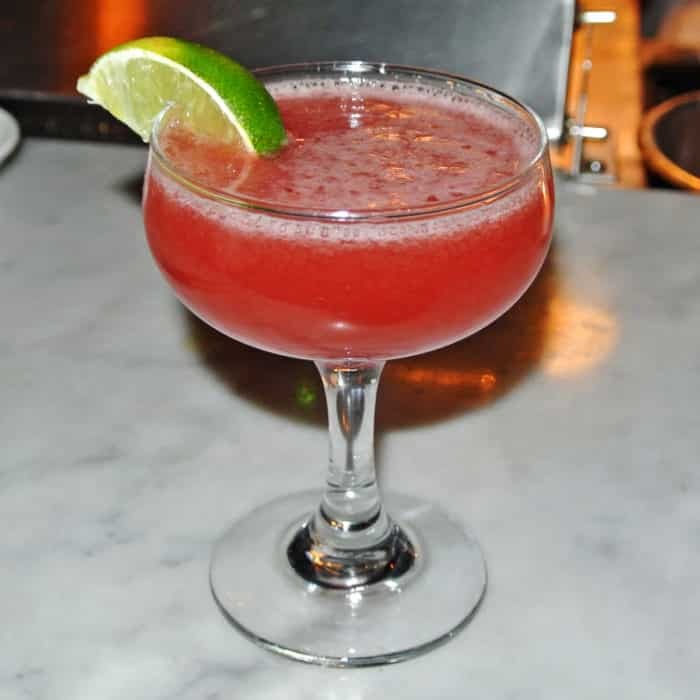 My drink, the Buddy Bye #2, was made with Smith & Cross Rum, Romagna Brandy, Blackberry Shrub, and Lime. For those unfamiliar with shrub, it is a basically a drinking vinegar so it’s a pretty unusual taste for those who are not used to it. This drink was very bold with many competing, complex flavors. I definitely sensed sweetness, tanginess, bitterness, sourness, and smokiness all at once providing a really unusual but definitely intriguing and interesting flavor with every sip. Soon after the cocktails arrived, so did our entrees. 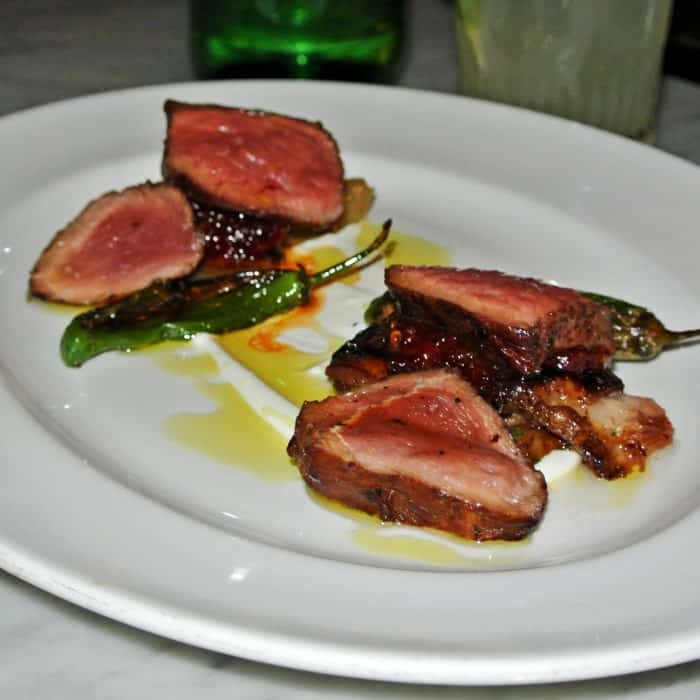 Amy selected the Leg of Lamb and Belly with Shallots, Shishito Peppers, Yogurt, and Calabrian Chile. I think I can comfortably say this was the best, most interesting lamb dish I’d ever tasted. The meat was impeccably cooked with such an amazing pink juiciness inside the lamb leg along with intensely fatty, crispy, melty lamb belly. Explosively flavorful sauces and veggies completed and tied the dish together so well. The vegetal spiciness from the roasted shishito peppers in combination with the in-your-face Calabrian Chile spiciness and creamy, cooling yogurt making for an outstanding flavor and texture mixture. And as extraordinary as Amy’s lamb dish was, I think my entree was just as impressive. I chose the Beef Tongue with Carrots and Dill and I’ve honestly never had anything like it. These thick slices of beef tongue had that rich, meaty Jewish deli meat flavor you may have tasted in pastrami at a place like Katz’s but this tongue had an incredible texture unlike anything I’ve had before. The slices had an awesomely crispy, charred crust on all sides which yielded to reveal the most tender, melt-in-your-mouth meat I’d ever had. The carrots were also cooked really well and the creamy, dill-jus was a perfect accompaniment to every swipe of the fork. Already absolutely astounded with the meal, we couldn’t resist trying one of the dessert options. We stuck to our guts and selected the most unusual sounding dish on the menu, something called a Ricotta Crostata with Lemon Crema and Mustard Caramel. 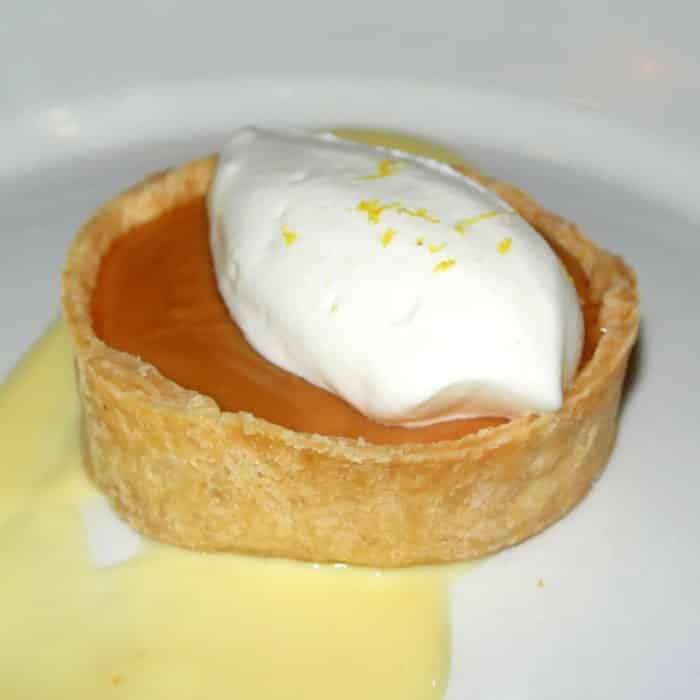 What arrived was a little tartlet filled with a thick layer of ricotta cheese, some sort of caramel substance, a large dollop of something fluffy and meringue-like, and a creamy, milky sauce below. This was another expertly concepted and executed dish, but besides the really interesting combination of textures it did not have the same wow-factor flavorwise that we had experienced with the rest of the meal. Don’t get me wrong, this was a very nice dessert, but most of the other dishes we had really blew us away with a twist of some sort and we just didn’t find that in this dish. 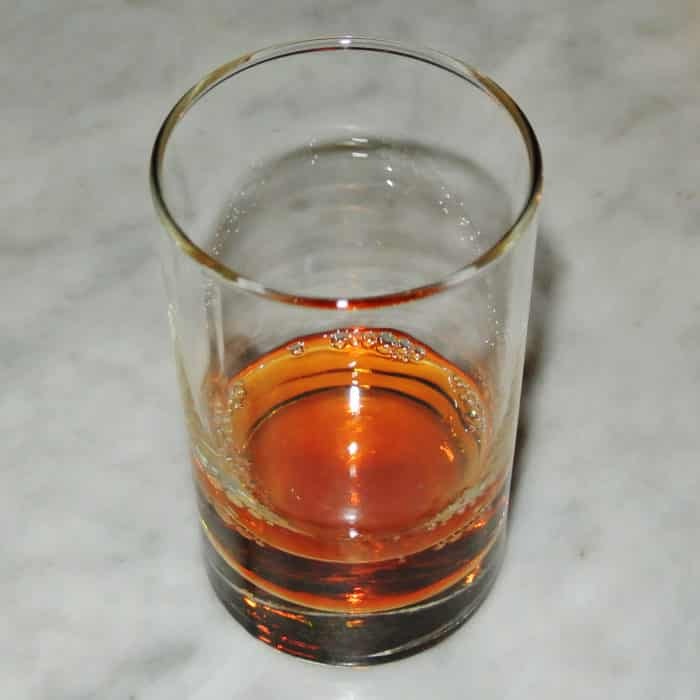 Right after we placed our dessert order, our waitress was kind enough to offer us a small glass of Amaro Montenegro as a digestif. This amaro was fairly tame compared to an amaro like Fernet Branca, but had a really smooth and pleasant root flavor and was a really nice gesture to enjoy with dessert. Feeling satiated and a bit tipsy, it was time to ask for the check. 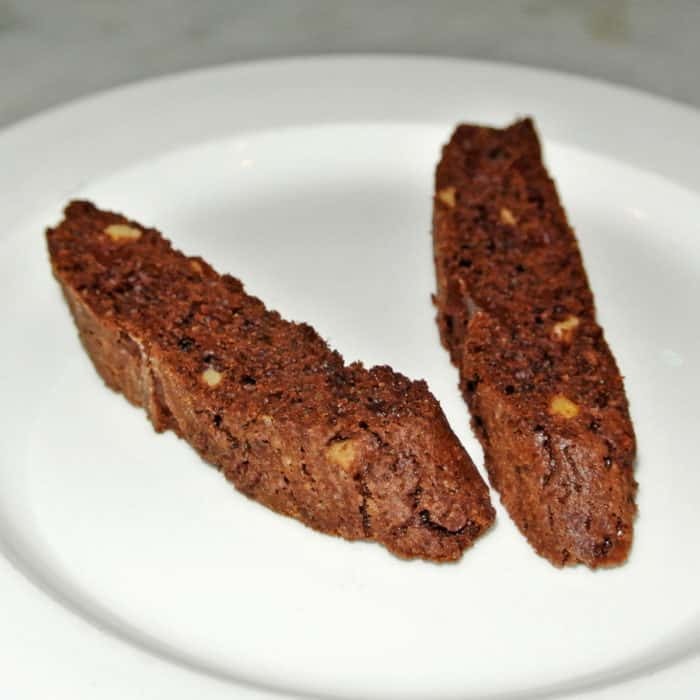 Along with the check a plate of chocolate biscotti arrived, an excellently crunchy way to close out the meal with one final bite of mild sweetness. With all of that being said, I think I’ve found my new favorite restaurant in NYC. Every dish was impeccably made and extraordinarily delicious. Whether you’re having a cocktail, pasta, or meat it’s hard to miss with any of the excellent options on this truly inventive, incredible menu. 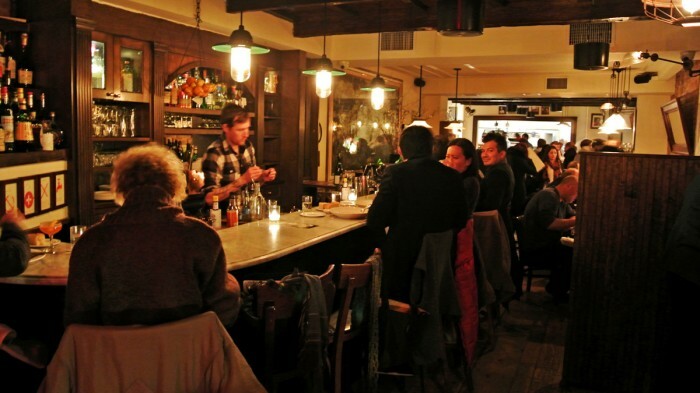 Know of another date night restaurant with excellent, forward-thinking cuisine? Let me know in the comments below. You have to check out Duck’s Eatery, their goat neck for two is stupid delicious and their yakemein soup has a seafood and brisket base that shouldn’t work but DOES. I actually went to Duck’s when they first opened, I thought the food was delicious, but pricey for the portions. I’ll have to give it another shot, that goat neck sounds right up my alley! Is It Sushi? Is It A Burrito? Or Is It Something Else Entirely?